I can't really afford the small fortune required for a Jinglebox. I've been looking at a Boss Compression Sustainer SC-3 pedal on YouTube and it sounds pretty good. I can't find anything on YouTube that shows it in action with a Rickenbacker 12 string. Can anyone give me any advice on this? Does it get near McGuinn's tone at all? I've seen one on Amazon for £50 which seems like a steal and I'm ready to pull the trigger on it. I watched some more YouTube videos and reviews of the Boss and really wasn't getting a good feeling so, .......I bit the bullet and bought a Jangobox JB-1 from their website today. See how you like the Dingle Box. I tried one but couldn't get the sound I was looking for. Then I bought an MXR Dyna-Comp compressor, and that was the sound I was looking for. A friend of mine ran two Boss compressors with his 360/12, but to me it sounded too harsh. I would have liked to hear how it sounded with just one Boss running, but I guess it wasn't to be. I know plenty of folks do like the sound of the Box--it probably has to do with amps, settings, etc. I've been wanting to try an older Boss CS1. Has a treble switch and everything. I ended up paying €200 for a Janglebox JB1. It was nearly six weeks from the day I ordered it to the day it arrived, which was last Thursday. I'm glad I bought it as it's delivering those Roger McGuinn jangly tones in spades. I can't speak more highly about it. It was well worth the money. Not only does it sound great with my 360/12 but it also manages to find the sweet spot with all of my other Guitars as well. 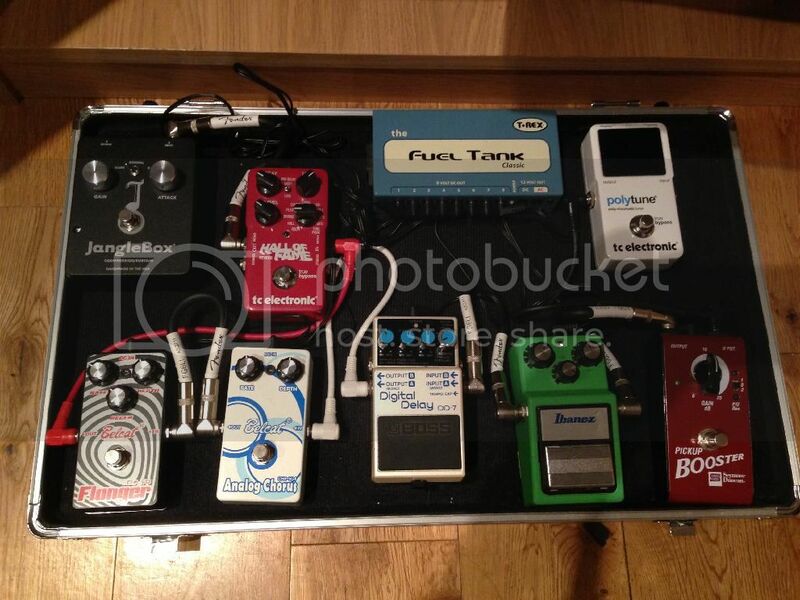 Here's a picture of it on my pedal board. I've owned both a CS-3 and two Jinglebloxes, as well as several other compressors. The Janglebox is wonderful and very easily yields the sound you are likely thinking of from a Rickenbacker 12-string. The CS-3 and others (without treble boost) didn't do it for me. The Jingleblox works great on 360/6 as well. I use it with both pickups on while covering Sultans of Swing, for example, and it does a superb job giving clarity and twang. I have both a Boss CS-3 and an original Janglebox. The Boss pedal does not generate that McGuinn jangly tone like the JB does. I'm not saying the Boss CS-3 is bad, its just different sounding. It has many good purposes and I tend to use it with High Gain pickup equipped Ricks and the JangleBox more with the Toaster equipped 12-ers. I know it's a bit of 'posting after the stable door has bolted' or whatever, but I would suggest that the Boss CS-1 is a better option. The CS-3 is a bit too smooth whereas the CS-1 has a real bite to it (gets a nice crisp attack and really makes the guitar ring) and has a 'treble/ normal' switch which lifts the treble (obviously). Having said that, the CS-1 is a bit rare so might not be as cheap as it used to be! Remember that compression is overrated and overused. Remember that McGuinn already had his guitar technique mastered as a banjo player before going into the studio with Rick 12. Remember that the first compressors were actually limiters dialed up an extra notch, most notably and famously the Fairchild. As I did, before I knew anything about compression as a young teenager, first work on your technique for fretting and picking to get the most out of a guitar with an even tone across the fingerboard and up and down the neck. Then a shade of just about any high-quality compressor will help enhance jangle. And no, none of them will give you McGuinn's tone. His tone is in his hands with his choice of finger picks and technique. The rest will get a player close so that we may all enjoy playing and listening to his songs.